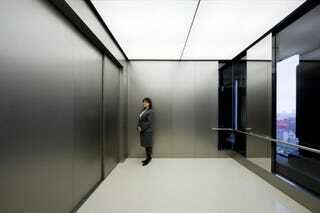 It could be the world's largest elevator. Measuring about the size of my living room, an office in Osaka, Japan, has installed five of Mitsubishi Electric's largest elevators—capable of squeezing in 80 people each. It measures 3.4m wide, 2.8m long and 2.6m high, and can take 5,250kg of weight—an average of 65kgs per person. If all five elevators were in operation at once, with full capacity, they could carry 400 people up the 41 floors of the Umeda Hankyu Building.